About 30 per cent of Saudi men are unemployedtoo proud to take low-paying jobs filled by foreigners, and unable to qualify for good jobs because the nations schools are third-rate. Unfortunately, the oil industrythe backbone of the Saudi economyis not labour intensive. National oil concern aramco employs only 50,000 in a nation of 20 million. 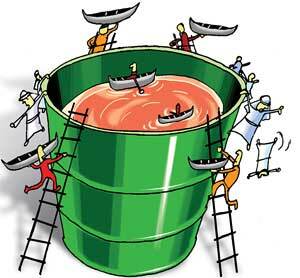 That is the paradox of many oil-rich countries; their oil brings trouble rather than prosperity. Norway is the outlier to this statement; other exceptions are tiny nations with large reserves Kuwait, Brunei, and uae. 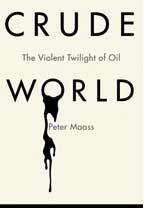 In Crude World former New York Times journalist Peter Maass visits nations blessed with some degree of oil riches. His first stop is Equatorial Guinea.The hospital Maass visited had no medicine, and there was no medical school to supply it with doctors. Despite billions in foreign investment, the local economy benefited little. He finds a kleptocratic dictator enabled by hear-see-and-speak-no-evil Western oil executives. In Ecuador he witnesses a tragically befouled rainforest and the quixotic effort to call to account the oil company liable for the mess, Chevron. In Venezuela, Maass finds a populist strongman, Hugo Chavez, who brazenly but unsuccessfully raids the national oil companys coffers to pay for well-meaning, if doomed, welfare projects. But Maass does not do much justice to the books subtitle, twilight of the oil economy. There are occasional hints at the alternative history that might have beenif only Ronald Reagan had not dismantled the solar panels Jimmy Carter put on the White House roof. Maass does give us an evocative glimpse of one future alternative he would prefera giant wind farm he discovers in California. Set against the blue sky and the brown desert, in rows of rotating white arms that glint in the sun, the turbines have the appearance of futuristic totems waving at us, luring us forward, Maass observes before signing off.